Saying "Theresianum" one usually refers to one of Austria′s most exclusive private schools, which is located in a Baroque Palais in the 4th district of Wieden. This Palais is also home to the Diplomatic Academy, a post-graduate school for international affairs where I have the pleasure of being a student as of autumn 2008. The building′s origins can be tracked back to the early 17th century: In 1614, Empress Anna purchased a large farmhouse with a stretch of land on this site and built herself a fancy little summer manor called "Favorita". It was used as a sort of super-sized folly, where concerts, opera performances and receptions were held in a relatively casual setting - taking advantage of the countryside feel just outside of the city walls. When the Turkish troops advanced on Vienna in the course of the Second Siege of Vienna in 1683, the Favorita manor was destroyed. Only seven years later, in 1690, a new manor was built with all the typical features of a generous "Gartenpalais" (for details on that, see my article on the Palais of Vienna). It was much bigger and splendid than the original manor and became an important stage for courtly life of the late-Baroque bloom of Vienna. Empress Maria Theresia inherited the Palais Favorita from her father, but sold it for 30,000 gulden to the Jesuite Order - which is remarkable insofar as Empress Maria Theresia was rather hostile towards the Jesuites and their ever-growing power. 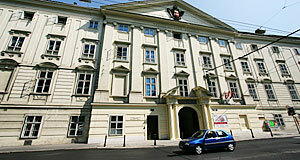 She tried to reduce the influence of the Jesuites on Vienna Universtiy, for example. The Jesuites used the Palais Favorita to found a school called "Collegium nobile" - a training facilities for young noblemen who were to become civil servants. The Empress "adopted" the facility and supported it financially - soon it was called "Collegium Theresianum" and made an Imperial Academy (which meant essentially some privileges and more money for the school). The son of Maria Theresia, her successor Emperor Joseph II (he of the movie "Amadeus") disliked the Jesuites even more than his mother and dissolved the entire order in 1773. In 1773, the Collegium Theresianum was closed down, too, and the Palais Favorita became home to a new school of engineering. The "Collegium Theresianum" was re-founded in the late 18th century under the rule of Emperor Franz II of the Holy Roman Empire of German Nation, who later became Emperor Franz I of Austria. Emperor Franz got the piarist order to run the college - the ones from the Piaristenkirche Church. Under their guidance, the building was re-furbished and got a neo-Classical façade. In the course of the social events that had led to the revolution in 1848, non-noble boys were admitted to the Theresianum and the school changed from a compulsory boarding school into voluntary one. The Theresianum survived the death of the Empire, but not the Anschluss: In 1938, the Nazis closed the Theresianum and used the Palais Favorita for a kind of political education school. After the war, the Soviet troops who administered the fourth district occupied the Palais. Later, it was refurbished and since 1957, it is again home to the Theresianum. The school has a reputation for having a high number of diplomat′s children among its students. This comes in handy with its "housemate", the Diplomatic Academy, which occupies some parts of the Palais Favorita. The Diplomatic Academy tracks its history back to 1754, when Empress Maria Theresia founded the "Orientalische Akademie" or "Oriental Academy" where diplomats could learn languages and study cultures of eastern countries. Due to this institution, the Diplomatic Academy claims to be the oldest school of international affairs in the world (always be careful with these superlatives…). In fact, the Academy underwent a reform in the late 19th century, after which it was called "Konsularakademie" and survived WWI and the collapse of the Empire. However, after the Anschluss the Nazis closed it and it was not re-opened until 1964 after an initiative by Chancellor Bruno Kreisky. The Diplomatic Academy was part of the Ministery for International Affairs until 1996. Today, it offers several courses and has approximately 140 students. It shares some facilities with the Theresianum. Attractions nearby include the ORF Funkhaus (which borders to the park and sport grounds of the Theresianum); the Karlskirche Church; the Palais Schwarzenberg and Schloss Belvedere Palace; the Old Technical Universtiy; and the other attractions of the Karlsplatz Square, such as the Musikverein Concert Hall and the Wien Museum.